"Steven Universe", created by Rebecca Sugar (who also worked on "Adventure Time"), premiered last night on Cartoon Network! 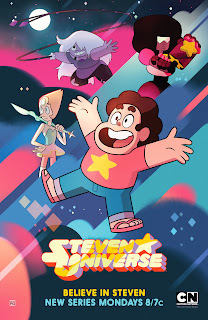 Leading up to the official premier, Smalls and I watched the heck out of all the clips as well as the first episode, "Gem Glow" (which was an early, free download via iTunes. Smalls does the "and Steven!" part of the opening credits & then eats a pretend hotdog. In "Gem Glow", we're introduced to "cookie cat" (see below), Steven's favorite and recently discontinued ice cream sandwich brand. 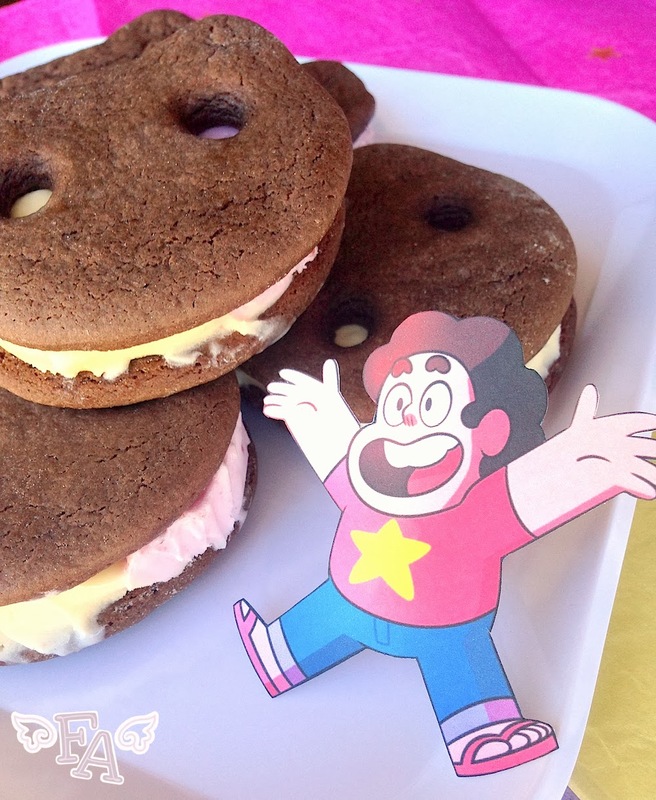 Does this dessert help him access his gem power? Or does his gem react from the euphoria he gets when experiencing something that tastes so good? (Or maybe it's comfort or nostalgia, it's a mystery!) It goes without saying, but I just had to make some cookie cats. For you guys, and for Smalls! 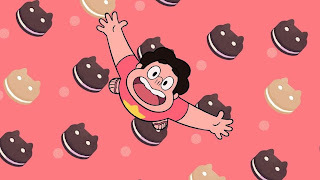 In fact, "Steven Universe", so far, has had so many mentions of food (hotdogs, doughnuts, hotdogs in doughnuts, fry bits, etc.) that I'm pretty sure I'll be revisiting this show on the blog in the future. 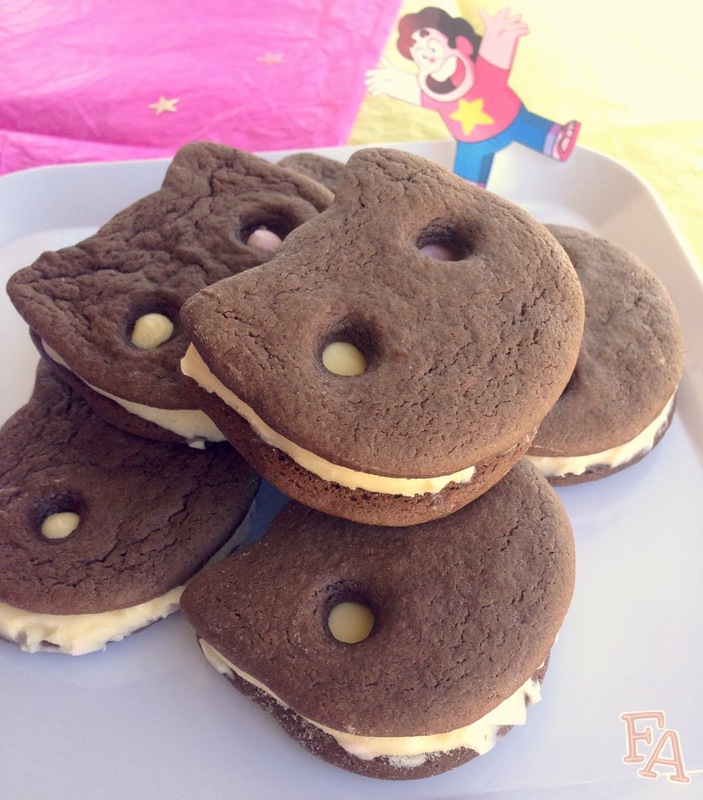 "Cookie Cat! He's a pet for your tummy. Cookie Cat! He's super-duper yummy!" "Oh sweet Cookie Cat, with your crunchy cookie outside, and your icy, creamy inside, you're too good for this world." Note: You'll notice in the image to the right, taken from Steven's cookie cat song sequence, that there are vanilla cookie cats! In the recipe below simply use yellow cake mix instead of chocolate & use only vanilla ice cream for the filling. Alternate Filling: Don't want to deal with melty ice cream? Use marshmallows instead! 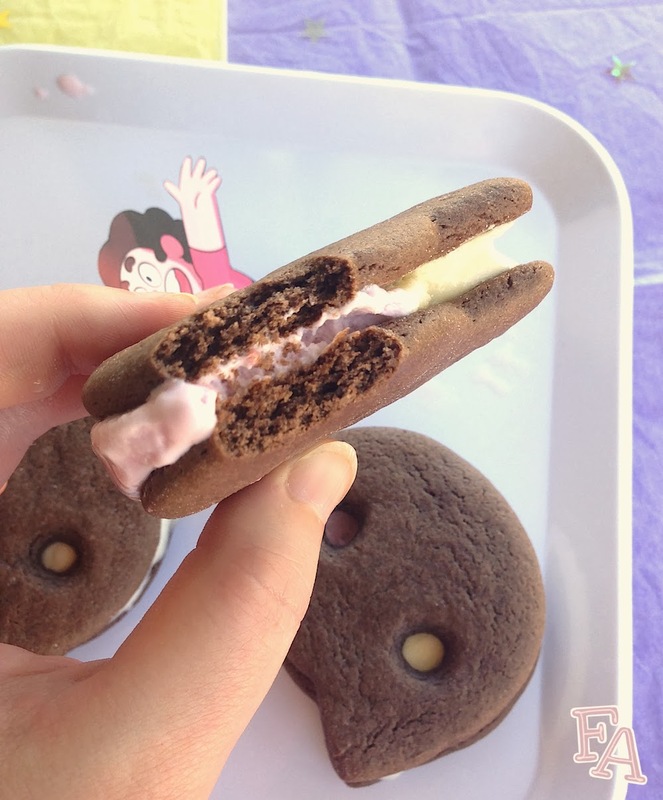 Place 1/2 a large white marshmallow & 1/2 a large pink marshmallow, cut sides down, on one cookie bottom & zap in the microwave for 15 seconds. Place the top cookie on & gently squish down so the marshmallows spread out to the edges. This variation is especially great for little "Steven" lovers, like Smalls. (See my Instagram post with this version here). 1. Place a sheet of parchment paper on a tray that has sides. Sit the containers of ice cream out long enough to be spreadable but not so long that they get too melty. Work quickly! Spread a strip of vanilla ice cream about a 1/2" thick & half as wide as your cat head cookie cutter. Next, spread an equal-sized strip of strawberry ice cream right next to (touching) the vanilla. Repeat this pattern again so you have vanilla, strawberry, vanilla, strawberry. Now cover the tray with plastic wrap & place it in the freezer overnight. 2. Combine the rest of the ingredients in a mixing bowl & mix until just combined, about 2 minutes. Wrap the resulting dough in plastic wrap (try not to eat it all) & chill it in the freezer for about 15 minutes. Preheat your oven to 375°F. Tear off a baking tray-sized sheet of parchment paper & dust it with flour. Using a floured rolling pin, roll the cookie dough to about 1/8" thickness. Cut an even number of cat head shapes about 1" apart & gently pull away the unused dough in between & roll it into a ball again to use for the next batch. Cut circles for eyes out of half of the cat heads, using a toothpick to "pluck out" (ouch!) the dough circles if needed. Place the parchment paper with the cookies on it onto a tray (optional: poke the faces gently with a fork for texture) & bake for about 5-6 minutes. Remove from the oven & let cool for a minute & then transfer the cookies to a wire rack to cool completely. Repeat the cookie process until you're out of dough (or you could freeze the dough for another time, or eat it directly, or roll it into balls & then roll the balls into powdered sugar & bake). 3. 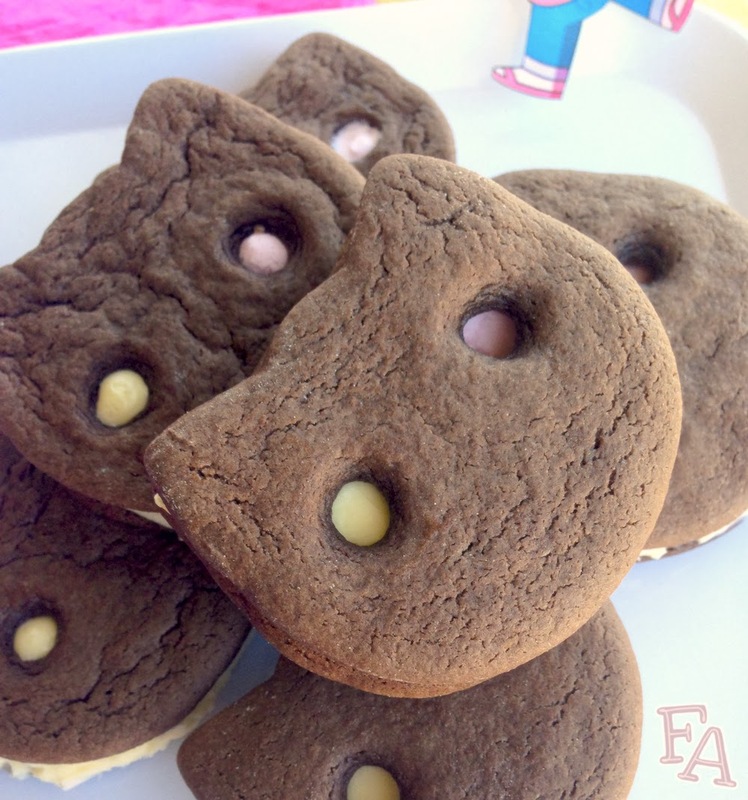 Once the cookies are cool, flip over all of the cat heads that don't have eyes so that their undersides are facing up. Next, pull out the tray of ice cream from the freezer & remove the plastic wrap. You'll have to work quickly! Starting at the bottom of the ice cream tray, press the cat cookie cutter into the ice cream equally between a strip of vanilla & a strip of strawberry. While the cutter is still in the ice cream, use a butter knife to scrape away the excess ice cream from the side of the cutter closest to you. Now remove the cookie cutter & slide the knife under the cut-out to transfer it to one of the upside down cat head cookies. Make sure the ice cream cut-out is centered & then place one of the cat faces (the ones with eyes) on top & gently press down. Repeat this process for all of the cat head & cat face cookie pairs. Wrap the cookie cats individually & tightly in plastic wrap & put them in the freezer so the ice cream can harden overnight (don't worry, the cookie part will become the perfect texture). When you're ready to eat one, remember to start with the ears! OMG this is perfect. I have a 3 year old that won't stop bugging me for Cookie Cats. Ever since he saw that episode of Steven Universe. Now all I need is a cat shaped cookie cutter. What ice cream brands did you use? I don't think I've ever seen a vanilla with such a gorgeous yellow color before, or a strawberry that didn't have huge strawberry chunks in it. Would you consider posting up a video of your process one day? Haha, you're right. Lion Lickers. Kids these days! For the ice cream I used Dryer's Slow Churned Classic Vanilla and Dryer's Lip Smacking Strawberry. The strawberry ice cream did have large chunks of strawberry in it but not tiny bits so it was easier to get plain pink scoops of ice cream to spread in the parchment paper lined tray. And as to the yellow of the vanilla in some of the pictures (like the ice cream cut outs) it's the lighting mostly. I fell in love too! So cute! These look so tasty. Thank you so much for the recipe, I can't wait to try them! However, I have a question. About how much does this yield? This recipe yields about 2 dozen individual cookies, so 1 dozen cookie cat pairs (= 12 ice cream sandwiches). Oh, my goodness. This is just too cute. Its possible to make your own cookie cutter so im thinking of just making my own and yeah. I'm definitely gonna make these! Is the ice cream part hard to do? That's great that you're gonna make your own cutter! 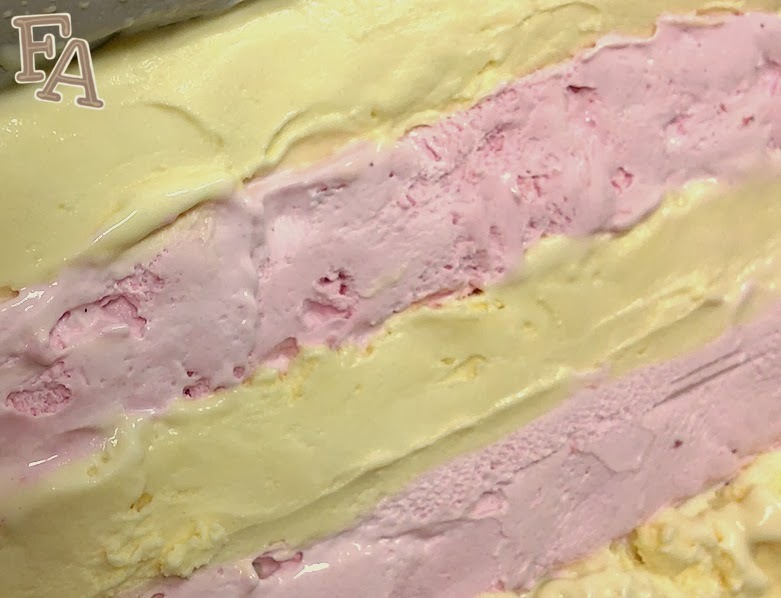 The ice cream part of this recipe can be kind of tricky because you're working with softened ice cream that gets softer and more melty byt he minute so you have to be fast AND your fingers will get very cold! but it's not so bad! I'm going to be working on an alternate filling recipe soon, so stay tuned! You can use waxed paper for the ice cream but not for baking the cookies. If you don't have parchment paper simply roll the dough on a floured surface to cut and then bake the cookies on a non-stick baking tray. Hi, I was wondering if I could ask you a question about the cookie cutter you used. how small/ large is it? I found a nice one that looks just like this one, but I'm wondering if its too small for this. Thank you! Hi, Tai. My cookie cutter is 3 1/2" across. Oh, gosh, Tai, I'm so sorry. My cutter is 2 1/2" across! I got THIS ONE off of Ebay. If you carefully stretch & squish it just right you can get a wider, more Cookie Cat looking cutter (and more Hello Kitty looking, too). You think you can do the Together Breakfast? These are adorable!! They look delicious. This is a perfect birthday party idea! Hopefully for my next birthday we can do something like this!! WOW, this is amazing, they look so cute and yummy. Love your blog! I would love to make these for my daughter's birthday! Although I have to ask; do you think thick buttercream icings in vanilla and strawberry would work? My sensitive teeth can't handle ice cream, and she's not fond of marshmallow at all, so I'm just trying to think of alternatives. Hi! I had a question about the cookies themselves, how do they taste? I made cookie cats with a recipe from Feast or Fiction, and my friend did the cookies, I think she followed the recipe but they're very very dry. I'm planning on remaking them soon. Is using the cake mix a better method? Thank you! Hi, Karly! I looove these cookies. They're based on a recipe handed down to me from my late great aunt, but I changed it a little for Cookie Cats by adding flour so the dough would be cut-out-able (as opposed to simply rolling the dough into balls as per the original recipe). It's just enough flour for the cutting though, not enough to make them dry. I wanted the cookies–when paired with the ice cream–to be soft and easy to bite into, so you don't have ice cream pushing out of the sides. So, yes, I think these cookies are yummy–not dry at all. ;) I hope they work out for you! I'm sorry you had this experience. I've made this cookie dough many times and it's always been very easy to work with. Hmm, the devil's food cake shouldn't have been a problem... For it to be too sticky it would have been a liquid ingredient issue... I'll make the cookies again and see if I can figure out what might have been the problem. Hello! Sorry it's taken me a little while to get back to you! I did the recipe twice, once using shortening and once using butter. Both times I used devil's food cake. The shortening version is definitely the nicer of the two to work with in terms of handling. The butter version is stickier, but I didn't find it unmanageable. 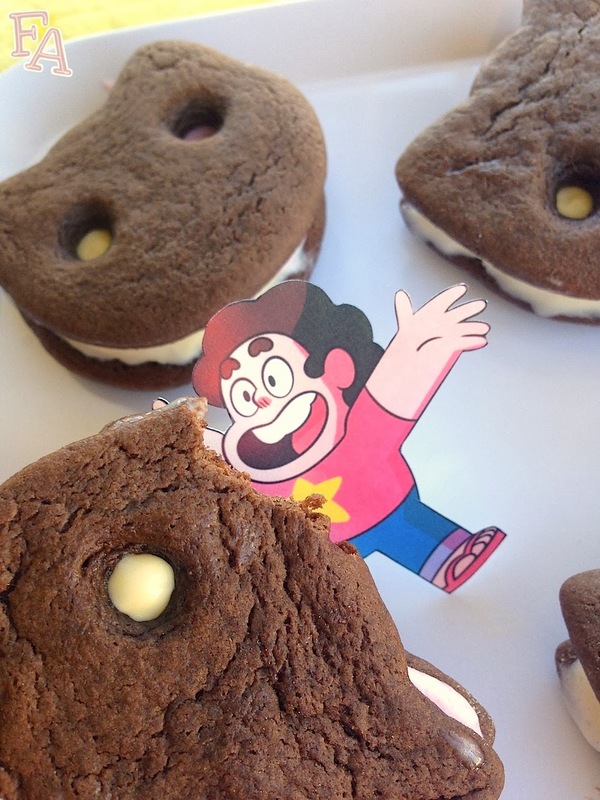 I made nice cut-out cookies with both versions. Again, I'm sorry you had a bad experience with it! It could be the humidity levels where you live? When I move between Scotland and England, I have extra notes on all of my recipes as it can vary by up to 10% with how much moisture I have to add. So perhaps just don't add the water?